Everything going good so far. Vettel seems to be committed doing lap after lap. Plenty of mileage. Can’t wait for Leclerc tmrw to get into SF90. I really hope Mclaren is good this year. I want the days of Ferrari vs. Mclaren to return. Merc would have wanted to get a lot of mileage on their brand new engine....they just got 30 laps from racing point. Ferrari got the highest milage. I hope for the same tomorrow. Merc's are "sandbagging".....yet again.....and will continue to do so during testing. Look at the 2019 laps and times vs 2018 laps and times. That’s why don’t believe toto ....!! Day 1 last year was cold and snowing, nothing to read into times from last year at all. 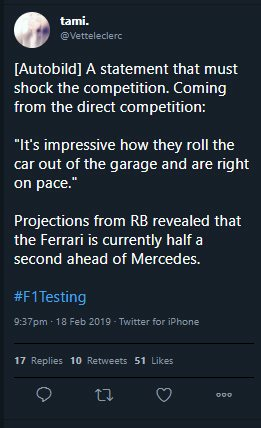 So we are not, Most of you doubted Ferrari last year and we did not do bad at all, infact we had the best car, if the team did not mess up with team strategy and Vettel mistake we would have won. Ferrari turned down their engine today and was also sand bagging. for me i see a well ballanced car and I really look forward to a good Ferrari year. Is it true Vettel set his best lap without DRS? I've always defended the 2018 car. It was equal to the W09. The drivers are another story. I believe the opposite of what Toto says; it's worked for me. The times are still incomparable. Tyres are completely different and Isola also said the track surface is too. I have to say it was a great first day of testing for most of the teams. The amount of laps Seb was able to put it was impressive. Most are already quicker that last year at the same time even though the quickest time during pre-season testing in Barcelona in 2018 was a 1:17.182 by Seb during the second testing week. So that's a full second slower and also the weather was much better today than a year ago. I don't think anyone will be near a low 1:17 this year but they might do a high 1:17 later. So this year's cars may not be a 1.5 seconds slower but maybe under one second. 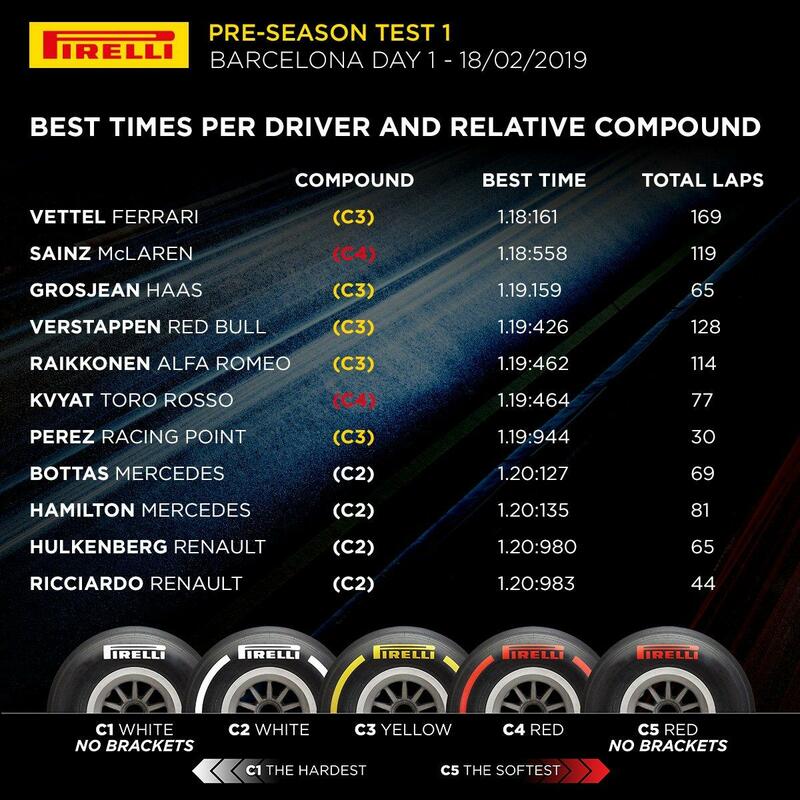 Last year's combined fastest times in Barcelona 2018. 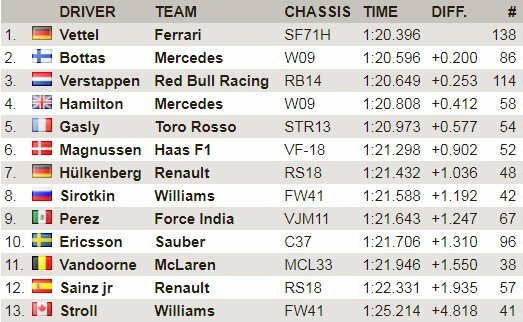 Most importanly for Ferrari was obviously running today without any major problems. Looks like the aggressive cooling works straight out of the box. Fingers crossed nothing happens tomorrow and later on. Yup track temp are diff from today’s testing. Looks like the aggressive cooling works straight out of the box. Fingers crossed nothing happens tomorrow and later on. Hard to say, running in clear air mostly and cooler temps. Yes, those factors still make it an unknown but at least nothing happened in clean air far away from other cars. That would have been worrying. Looking forward to tomorrows big lap number from our new star driver . Last edited by SilverSpeed; 18th February 2019 at 18:01. I really don't give a damn whom Ferrari is fighting, if you ask me it can be 2004 all over again! Didn't catch the testing session but the number of laps is impressive. Seb is looking happy with the car. The times aren't conclusive, they never have been in testing, but it's always nice to top the sheets. Mercedes are sandbaging big time as usual and like last year, they are concentrating on a harder tire stint. I don't see anything wrong with Karun's statement tbh. Fact is Ferrari should've imposed team order as soon as Vettel was behind Raikkonen. But they waited for 10 laps and Vettel was losing time, so yeah...not a good management. But thankfully we don't have the tobacco guy and "his friend" at Ferrari anymore, all in past now so let's concentrate on the present. And dare I say, it's looking good. Yes, Karun made several valid points about the way Seb's season fell apart last year, so let's hope he gets a fresh start in 2019, it is looking promising but it's only testing day 1, can't wait to see how Charles handles the car tomorrow. Alfa and Haas also looking good, what's not to like, except I'd prefer the Mission Winnow branding in white, just to give some contrast to all the black/dark grey bits on the car. Very very good day for Ferrari, quick and reliable, hopefully it is the final step forward to bring the trophy where it deserves to be. Schumacher spent four seasons without a WDC, coming close in 98-99 to his silver rival, but turned the tide in 2000. After so many years without a title it doesn't matter whether Vettel (enemy during RB years) or young and humble Leclerc is in front. A pleasure to read a text commentary and nothing goes wrong. I am worried about Mercedes and RB though. If they are quick and both Ferrari drivers are in the fight then it can turn out a bit like 1983 with Hamilton and Verstappen going for glory in Abu Dhabi with Ferrari winning a constructors' title as a consolation.